LDFDS students provide competition to Pixar: Pay attention Mr. Lucas! Amazing creations in paper maché. As a part of a study of Connecticut ecology, students in Class IV took a trip to Outer Island, a marine research and education center. They had an opportunity to study tide pools and the Branford Harbor, using a variety of meters to measure the water’s salinity, dissolved oxygen, pH and temperature. They compared these results to one another and observed the changes over time as the tide came in. They also got an opportunity to do some birdwatching, as the island is home to a bird sanctuary. Students in Classes II and IV are working together to plant and maintain vegetable gardens at the school. So far, students researched various plants that thrive in Connecticut’s climate, tilled the soil and weeded the beds, purchased supplies from a local Home Depot and planted seeds and small plants. Students in Class IV completed research on chemical cycles that occur in nature, such as the phosphorus and nitrogen cycles. After researching topics like the environmental impact of humans, they created posters and presented their information to the class. make snow ice cream! Storm Colbie/Juno left a nice blanket of fluffy snow, so the students in Class I, made snow ice cream that was shared with all. Recipe: 1 cup milk, 1/3 cup sugar, 1 tsp. vanilla, 8 cups clean snow (a bit more if it’s really fluffy), optional but recommended: sprinkles, chocolate sauce/hot fudge, &/or marachino cherries. In a large bowl, whisk milk, sugar & vanilla until combined. Put this in the refrigerator. Go out and scoop up some fresh, clean snow (about 8 cups). Then mix the snow and milk mixture until combined. Top with your choice of toppings & enjoy! Students in Class IV recently tried their hands at using the pottery wheel. Students in Class IV are studying civics, and they recently completed an activity to compare the powers given to the federal government in the Constitution, and powers reserved for the states. Students in Classes I and IV attended a performance of Steve Martin’s play, Picasso at the Lapin Agile at Long Wharf Theater. The play centers around a meeting between Picasso and Einstein at a Paris cafe, as the two discuss the value of art and science and the true meaning of genius. 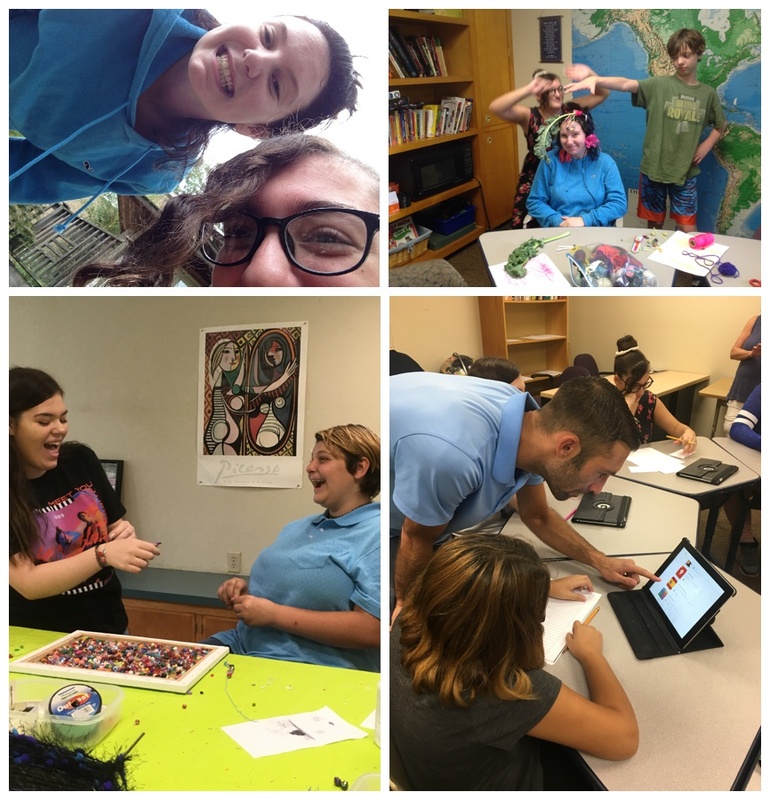 Before and after attending the play, students participated in workshops led by Long Wharf’s teaching staff, which discussed these themes in greater detail. Students and parents were treated to a special performance by one of Yale’s acapella groups, “The Spizzwinks (?)." They have a limited number of community concerts throughout the year, and LDFDS was lucky to be able to host one. Their unique blend of talent and humor was appreciated by all. Students in Class II recently began collecting monetary donations for two charities, The ASPCA and Save the Children. The students researched the charities and created small crafts to sell in their free time. Their dedication and excitement for the causes has been contagious! LDFDS is selected to participate in Wesleyan University's East Asian Studies Outreach Program. Students participated in a schoolwide field trip to the Mansfield Freeman Center for East Asian Studies at Wesleyan University in Middletown. The enrichment program included a brief overview of the countries that make-up East Asia, a talk and video about sushi, a lesson about the Beijing Opera, and a lesson about Chinese writing and language. Students had the opportunity to ask questions, color opera masks and to try their hand at writing using a brush and ink. An added bonus was being able to observe a hawk that was perched on the roof. As a part of the ongoing collaboration between Long Wharf Theater and LDFDS, students were invited to participate in an intergenerational discussion with residents of Tower One, an assisted living community in New Haven. The residents of the home were given writing prompts, which the students helped them to complete, that linked the themes of the play Our Town to memories in their lives. After writing, the residents and students joined together for a discussion of the residents’ responses. They discovered many commonalities, including the importance of family and how everyday routines become meaningful when done with the ones we love. The residents of Tower One and the staff at Long Wharf Theater were thrilled to be able to share this experience with the students, and look forward to discussions in the future! The students in Class 1 visited Lakeside Farm. We went for a ride in a wagon to see the property and gardens, spent time with the animals (llamas, chickens, rabbits, goats, an ostrich, peacocks & pheasants) and made pizza. The hand-made pizza was enjoyed by all, as were all the animals. Students attend production of Thornton Wilder's "Our Town" at Long Wharf Theater. Students in Class I and IV attending a production of Our Town at Long Wharf Theater. They also participated in three workshops led by teaching artists from the theater, which described the play’s themes, techniques utilized by the actors, and directorial decisions made by Gordon Edelstein. "Class 2 students were excited to host their parents at the first potluck breakfast. We shared delicious food and conversation, and played a fun guessing game. Thanks for attending everyone!" Amy's class studies Thornton Wilder's "Our Town" in preparation for attending Long Wharf Theatre's upcoming performance of the classic play. Students in Class IV are reading “Our Town,” the classic play by Thornton Wilder. Each student was assigned one or several parts to read. In October, they will have the opportunity to see a production of the play at Long Wharf Theatre, as a part of a partnership program between the theatre and the school. In addition to attending the play, students will have an opportunity to participate in the P.A.I.R. (Partnering Artist In Residence) program. Once a month, a teaching artist from the theatre collaborates with the classroom teachers to develop an interactive lesson that relates to the content being covered in one of the subject areas. The lessons frequently feature theatre and improvisation techniques that are taught in Saturday workshops attended by LDFDS staff.